Here are some Kwanzaa recipes from our Holiday Recipe site –Holiday Eats – to help make your holiday a fun and tasty one! Because Kwanzaa is a “first fruit” or harvest festival, Mazao (the crops) are an important part of the celebration. We have tried to include a good selection of recipes for vegetables and fruits dishes. 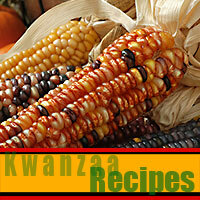 Visit our holiday recipe site, Holiday Eats, for more Kwanzaa and all your holiday recipes. Do you have a great Kwanzaa or other holiday recipe? Easily share your tasty holiday recipes with us @ Holiday Eats.